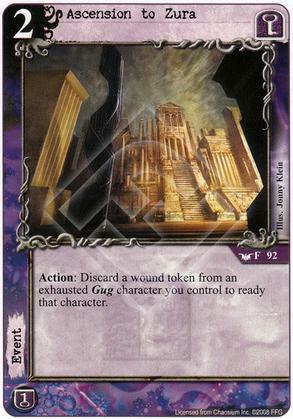 Action: Discard a wound token from an exhausted Gug character you control to ready that character. 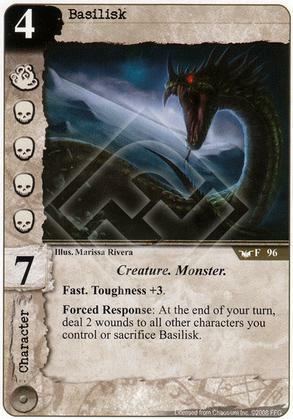 Forced Response: At the end of your turn, deal 2 wounds to all other characters you control or sacrifice Basilisk. Action: Choose a character. 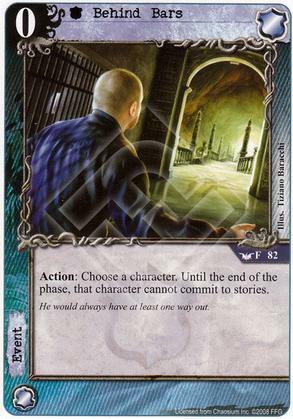 Until the end of the phase, that character cannot commit to stories. He would always have at least one way out. 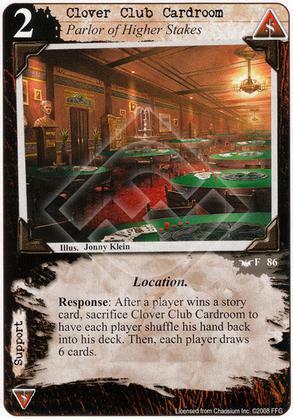 Response: After a player wins a story card, sacrifice Clover Club Cardroom to have each player shuffle his hand back into his deck. Then, each player draws 6 cards. 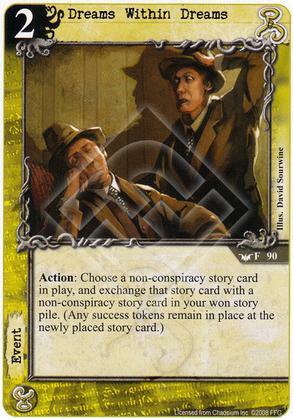 Action: Discard the top card of an opponent's deck. 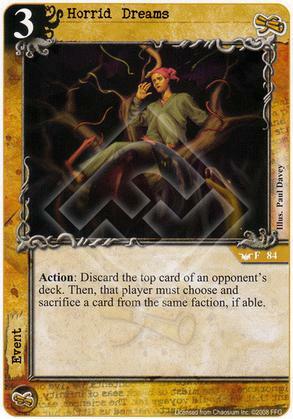 Then, that player must choose and sacrifice a card from the same faction, if able. 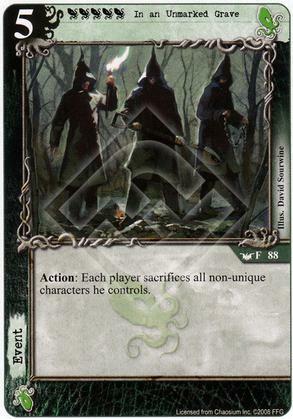 Action: Each player sacrifices all non-unique characters he controls. 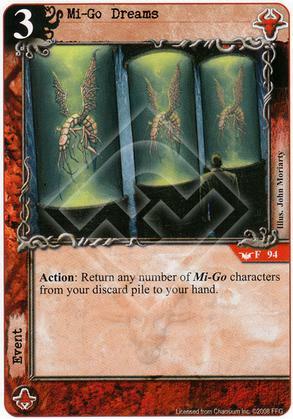 Action: Return any number of Mi-Go characters from your discard pile to your hand. 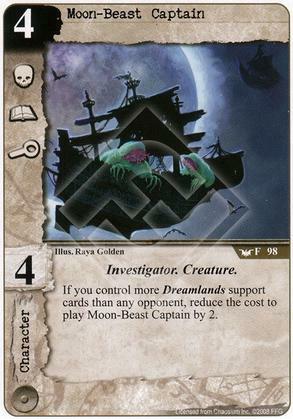 If you control more Dreamlands support cards than any opponent, reduce the cost to play Moon-Beast Captain by 2. 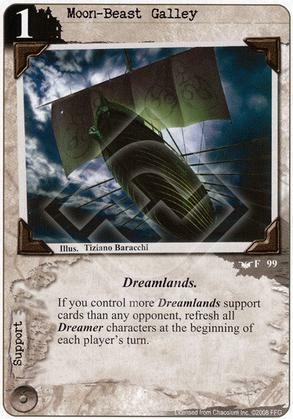 If you control more Dreamlands support cards than any opponent, ready all Dreamer characters at the beginning of each player's turn. Villainous. 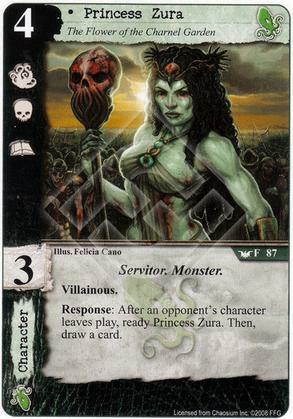 Response: After an opponent's character leaves play, ready Princess Zura. 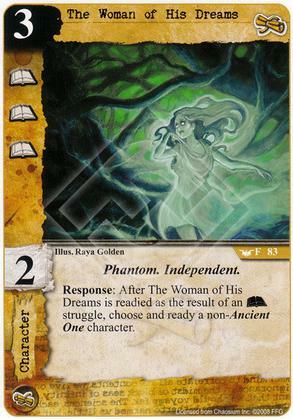 Then, draw a card. Richard Upton Pickman gains the icons of each attached Ghoul character. 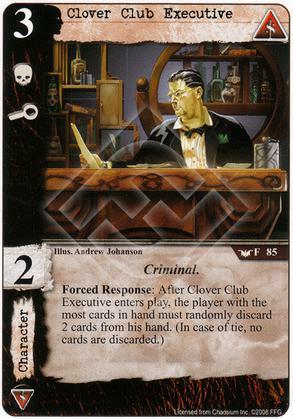 If Richard Upton Pickman would be wounded, you may discard an attached Ghoul character instead. 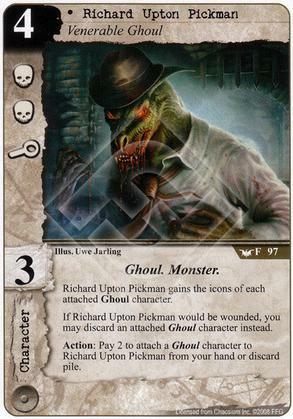 Action: Pay 2 to attach a Ghoul character to Richard Upton Pickman from your hand or discard pile. Night. It is Night. 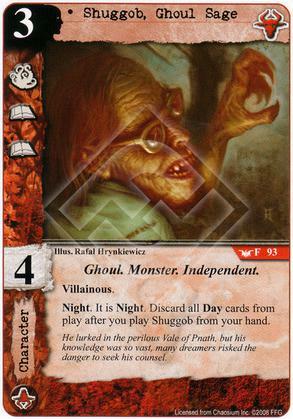 Discard all Day cards from play after you play Shuggob from your hand. 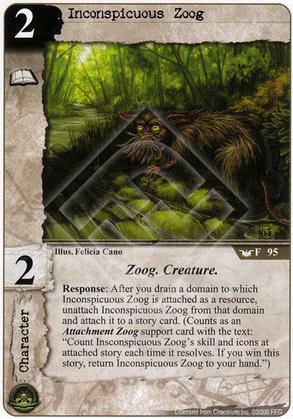 He lurked in the perilous Vale of Pnath, but his knowledge was so vast, many dreamers risked the danger to seek his counsel. 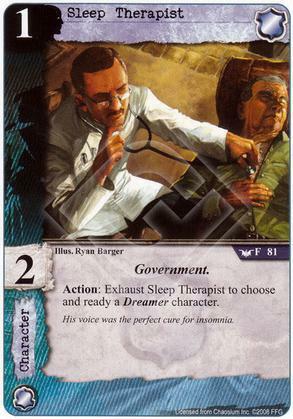 Action: Exhaust Sleep Therapist to choose and ready a Dreamer character. His voice was the perfect cure for insomnia. Play at the end of your story phase. Action: Choose up to 2 characters. Those characters do not refresh during the next refresh phase. Response: After The Woman of His Dreams is readied as the result of an (A) struggle, choose and ready a non-Ancient One character. Toughness +1. 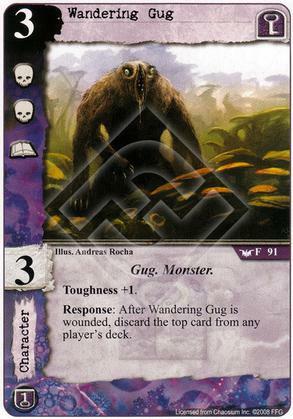 Response: After Wandering Gug is wounded, discard the top card from any player's deck. Loyal. 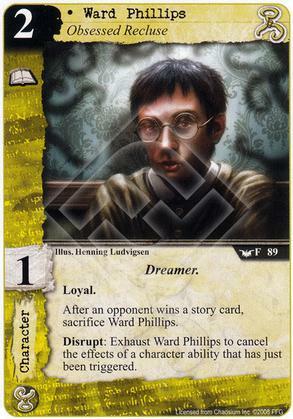 After an opponent wins a story card, sacrifice Ward Phillips. 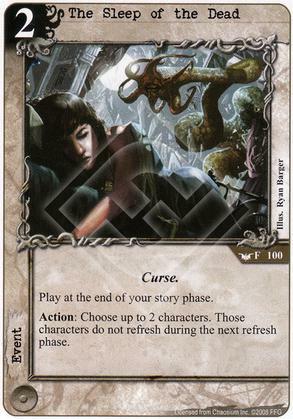 Disrupt: Exhaust Ward Phillips to cancel the effects of a character ability that has just been triggered.